Automobiles have come a long way since Henry Ford’s massed-produced Model T rolled off the assembly line in 1908. Cars have gone from ‘horseless’ to ‘driverless’ in just over a century. Today, the electronics systems make them state-of-the-art, but also vulnerable. Special devices called ‘gateways’ are needed for security, safety and efficiency, and NXP is leading the race to enable the best automotive gateway solutions. 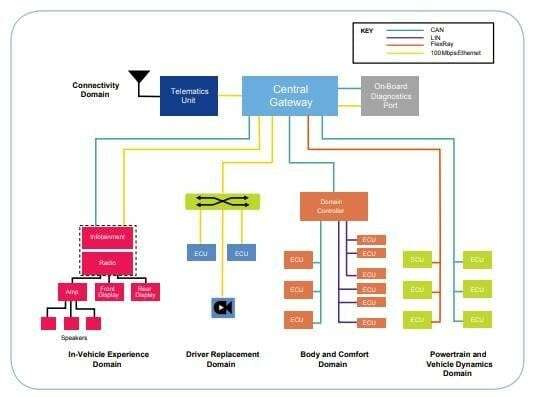 An automotive gateway is a central hub that securely and reliably interconnects and processes data across a range of vehicle networks. It provides physical isolation and protocol translation to route data between data-sharing functional domains, enabling new features. A gateway’s main function is to provide safe and secure communications between networks and ECUs (electronic control units). This includes linking the vehicle’s many internal networks and external networks. The seamless transfer of data is essential to ensure ECUs have the necessary information for a vehicle to operate smoothly and safely. Gateways also allow engineers to design more robust and functional vehicle networks that can make the driving experience even easier and more comfortable. The greater design possibilities are what make gateways so attractive to car manufacturers because it allows them to create new features, distinguishing themselves from the competition. 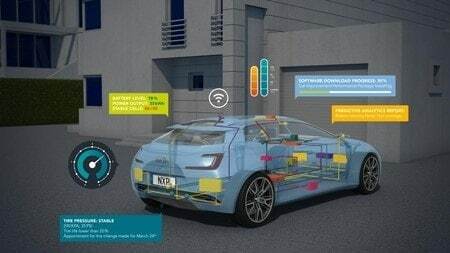 NXP is the world leader in gateway processors and In-Vehicle Networking (IVN), providing about half of all network connections found in a new car. As it is at the heart of vehicle networks, a gateway is also ideal to support vehicle-wide applications, such as Over-the-Air (OTA) updates and vehicle analytics with secure communications to OEM servers (cloud). The few vehicles that support OTA updates today typically only update the infotainment or telematics systems. But OTA updates through a gateway, which interfaces with all vehicle functional domains, allow OEMs to remotely fix/prevent vehicle problems, address security vulnerabilities, and enable new features that improve the user experience and can generate revenue. NXP has optimized gateway processors to support efficient and flexible OTA updates. NXP is also deeply involved in developing security solutions because automotive networks can be vulnerable to cyber-attacks. Hackers could extract assets such as private information or cryptographic keys, or impair a vehicle’s operation by exploiting implementation vulnerabilities. These security risks can be reduced by NXP’s Secure Gateway; a comprehensive, multi-layer approach for automotive security, which acts as a firewall for external interference. NXP’s Secure Processing layer’s many features include; secure boot and real-time integrity checking schemes to guarantee code is authentic (trusted and unaltered), an embedded Hardware Security Module for cryptography & secure key management and much more to ensure a vehicle’s safety and integrity. The next trend in automotive solutions is the move to multi-gigabit Ethernet for internal networking, and eventually as a linchpin for communications between domains. NXP is leading the way to enable next-generation automotive gateways with optimized solutions.